The (oil) ports on a valve. A 3-way valve has 3 ports: pressure (P), tank (T), and cylinder (A). A 4-way valve has 4 ports: pressure (P), tank (T), advance (A) and retract (B). Single-Acting cylinders require at least a 3-way valve, and can, under certain instances, be operated with a 4-way valve. Double-Acting cylinders require a 4-way valve, providing control of the flow to each cylinder port. The number of control points a valve can provide. A 2-position valve has the ability to control only the advance or retraction of the cylinder. To be able to control the cylinder with a hold position, the valve requires a 3rd position. The centre position of a valve is the position at which there is no movement required of the hydraulic component, whether a tool or cylinder. The most common is the Tandem Centre. This configuration provides for little to no movement of the cylinder and the unloading of the pump. This provides for minimum heat build-up. The next most common is the Closed Centre configuration, which is used mostly for independent control of multi-cylinder applications. This configuration again provides for little to no movement of the cylinder, but also deadheads the pump, isolating it from the circuit. Use of this type of valve may require some means of unloading the pump to prevent heat build-up. There are many more type of valves, such as Open Centre and Float Centre. These valves are used mostly in complex hydraulic circuits and require other special considerations. Controlled by a 4-way, 3-position valve. 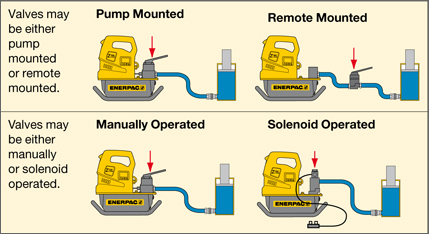 The oil flows from the pump pressure port P to the cylinder port A and from cylinder port B to tank T.
The oil flows from the pump pressure port P to the tank T. The cylinder ports A and B are closed: the cylinder plunger will maintain position. The oil flows from the pump pressure port P to cylinder port B and from cylinder port A to tank T: the cylinder plunger will retract.